The Ranger RP-20FC oil-filter crusher applies 10-Ton (9-mt.) of air-operated pressure to just about any used oil filter or can. Reduce filters to 20% - 25% of their original size and remove 95% of the oil. An integrated collection chamber, collector downspout and included stand make oil recovery a cinch. 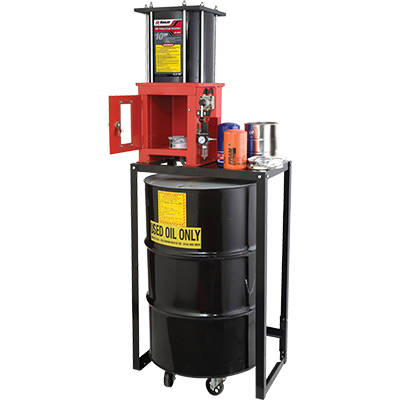 This oil filter crusher and paint can crusher expertly crushes even your toughest filters and cans to 20% - 25% of their original size in seconds. At the drastically reduced size, cans and oil filters are much cheaper to dispose, so the Ranger RP-20FC is good for the environment AND your bank account. Perfect for crushing light-duty truck and automotive filters. Even those 203 mm tall filters found in power stroke diesels will fold under the massive force of this crusher. The average auto repair shop ends up with hundreds or even thousands of oil filters every year, all filled with sludge and used oil from engines. Because of this, used filters are viewed as contaminated waste by the EPA, which mandates tough disposal regulations. This crusher separates 95% of the waste oil from the metal and recycles it into a storage container of your choice for proper disposal. This means that rather than having a stack of bulky, dirty oil filters sitting in your shop, you end up with a neat pile of clean scrap metal and an easy-to-manage container of used oil that can be disposed of cheaply and conveniently. Best of all, the entire process is in full compliance with EPA disposal guidelines. The Ranger RP-20FC oil filter crusher provides the perfect solution for getting rid of used filters. Once crushed, you can deliver them to a metal recycling facility where you’ll get paid for the scrap value of the metal. This is a much better solution than paying a fee to deliver the used filters to an approved recycling collection centre. When you consider the cost of typical EPA-approved oil filter disposal for contaminated waste and consider the return you will receive from a scrap metal dealer and oil collection company, the RP-20FC pays for itself in no time. The included stand is perfect for supporting the RP-20FC oil filter crusher on top. Conveniently place your oil storage tanks within the stand for clean, efficient collection of residual draining oil. The stand’s rugged metal construction is recommended for use with the Ranger RP-20FC Oil Filter Crusher. Its generous design accommodates 18.9-L, 60.5-L and 208-L used oil storage tanks, and the tanks fit even when even they’re positioned on top of drum dollies. Residual oil sludge will drain right into your storage tank. The stand itself is constructed from robust metal and holds over 104 kg. of oil. You won’t have to worry about knocking into barrels of oil ever again. Setup is fast and easy, even if you’re new to this type of shop equipment. Simply put, putting an oil filter crusher stand in your shop is a great way to keep the entire process together and make your shop life that much better. You'll also be delighted by the space-efficiency and safety this unit brings to your work area. Simply slide storage barrels beneath the stand and you're done! The tanks are now ready to receive waste oil from the crusher's downspout tube. It doesn't get any simpler. If you need even more crushing power, the RP-50FC is Ranger’s latest and most powerful oil filter crusher yet, offering ​22,679 kg. of crushing force. 318 mm diameter cylinder providers a maximum crushing pressure of ​9,071 kg. Rugged metal construction holds in excess of 104 kg.